How Do I Finance my Tiny House? Lil Blue is an 8x20 on-grid tiny house built by Tiny Living Spaces out of Henniker, New Hampshire, with one lofted bedroom space access by pull-out stairs, a full kitchen, a huge bathroom with shower, lots of storage, built-in bench/living space, skylights, and a drop-down porch. It is mostly electric (lights, plugs, mini-split heat/cool, induction cook top, oven, dishwasher, tv/entertainment system) with a propane on-demand hot water heater. It requires year-round, on-grid, pressurized fresh water to supply the kitchen sink, bathroom sink, and shower. Lil Blue can be set up with a flushing toilet (needs sewer or septic hookup for this), or we can provide a Separett composting toilet or the cute little composting bucket system as seen in the pics. 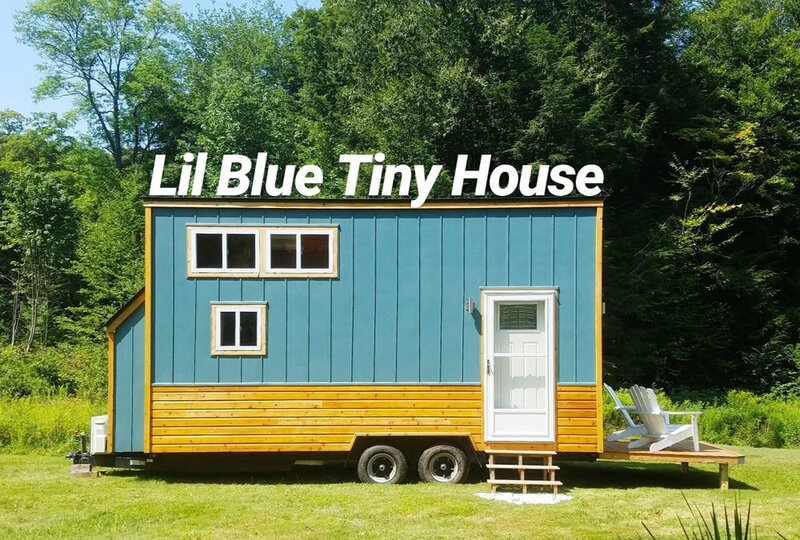 Head over to our Instagram stories (@tinyhousecrafters) to see Lil Blue in action! Interested in what it takes to make Lil Blue your home? But not sure where to get started? In this blog post, we will talk about how to take the first steps toward the tiny life with Lil Blue! But don’t be deceived, tiny home ownership is quite a handful and requires an adventurous spirit and a lot of work. However, there are so many people who are thrilled with their tiny house, downsizing their life, saving on bills, and starting a new, exciting chapter. And yes, this could be you!! First things first - get your payment plan sorted out. One important thing know about buying Lil Blue is that the financing option being offered is to Rent-to-Own, not an offer to just rent out the tiny house long term like an apartment. You must be willing to own Lil Blue, which means paying the down payment and then contractually agreeing to pay a certain amount per month until the total amount it paid off, like a mortgage. Note: Because Lil Blue is a tiny house and tiny houses are notoriously hard to classify, it is hard to get a loan for one. Once the payment plan is sorted out, it’s time to move your house! You do not need your own vehicle to move Lil Blue to it’s permanent parking spot. You can hire a qualified third party to move the house by looking into local hauling companies - which might be a good move for anyone unfamiliar with moving a load as large as tiny house anyway! Another good option is Uship.com, which is kind of like an eBay but for hauling and moving needs. We’ve used it a bunch of times with great success. How much will it cost to move the house? This will obviously very based on where you are located. Budget for at least $250 for somewhere within three hours of our shop in Londonderry, Vermont. In general, you will see prices with an average of about $2 / mile. What kind of truck do you need for the job? If you want to move Lil Blue yourself, you will need a ½ ton to one ton truck such as an F-150 or F-350. Pay special attention to the towing capacity of the vehicle you plan to use to haul the tiny house. The towing capacity should be 11,000 lbs or greater as Lil Blue weighs about 10,000 lbs unfurnished. If you are still interested in hauling Lil Blue yourself, you can always rent a vehicle! Here is a great resource on all you need to know about tiny house towing. Once you’ve gotten your house, it’s time to park it! General tiny house parking sites fall into two categories: purchasing your own land or renting land from someone else and improved or unimproved sites. An improved parking spot means you are located near a house that you can use to piggyback your resources from or somewhere that has utility hook-ups like an old mobile home lot. Unimproved parking would mean there is no power or water, just a friendly square of land for you to park. Note: if you plan to piggyback Lil Blue off of an existing structure for your electricity needs, make sure you have a dedicated breaker connection (more than just an extension cord) so you can properly power the electric heat source. In the winter, the mini-split heater will draw a lot of power and you don’t want to get into a situation where breakers can pop on you in the middle of winter! Parking takes a bit more effort than just dropping the house off and moving in. Once the house is in place, you will need to pay special attention to leveling and stabilizing the house to prevent unwanted movement, improper settling, and water infiltration issues. We recommend using tools like these to safely park your house: wheel chocks and farm jacks. Currently, Lil Blue needs on-grid utility connections like water, sewer/septic, and electric power in order to be considered move-in ready. But can Lil Blue be used off-grid? Well, yes AND no. In my opinion, Lil Blue is not well suited for a quick transition into off-grid living. You can get away (as we did for a spell) with a composting toilet and fresh drinking water jugs, but that would mean no showers and lots of water refills and you would still need electricity and somewhere to legally drain your sink water. This is a very rustic option. Going off-grid is a lot of work. It’s actually a good thing that Lil Blue is situated for on-grid living because that is truly what’s the most simple and modern and it means that it can be hooked up and lived in with little fuss. Off-grid living requires a lot of hands-on physical labor and system know-how. If that doesn’t sound that appealing to you, then finding an on-grid parking location is probably your best option. This doesn’t mean that Lil Blue could never be off-grid. It would require fresh water tanks (and some retrofitting to get the tanks to fit nicely), a pump system, composting toilet, sanitary gray water drainage solutions, and solar power. And a can-do attitude, of course! All of these systems would then need to be tied into the existing system. Not impossible, but it would take some level of knowledge about these systems as well as a considerable investment, especially if you need to hire professional help. Getting Lil Blue ready for off-grid living can cost anywhere from $5,000 to $25,000 depending on what systems you decide to install and how big they are. So now that you have your utilities sorted out and set up, it’s time to finally move in! Hopefully you’ve been working hard on your downsizing so the tiny life isn’t such a shock. Storage is limited! There will probably not be much extra space left for other furniture or large objects. But that is the spirit of minimalism after all! The current price for Lil Blue does not include the household items shown in the pictures. However, if you are interested in what you see in the photos, let us know and we would be happy to negotiate. If you plan to be living in Lil Blue in New England or other northern climate, one must always keep winter in mind. Tiny houses up north will need a bit of seasonal maintenance for dealing with harsh cold. First and foremost you need to focus on protecting vulnerable, under trailer connections like fresh water intake and gray water discharge. Secondly, you will need to make sure that your tiny house is safe from cooling down rapidly and freezing. Tiny houses are so small that if the heat source cuts out, it will cool down very quickly and put your plumbing and occupants at risk. It’s always a good idea to have a backup heat source or a plan in place should your heat go out in the middle of winter. Last but not least, let’s talk a little about traveling with Lil Blue. I’m sure many of you are interested in the possibility of moving a tiny house around in a permanent state of adventure. Lil Blue would be a decent candidate for this lifestyle because of it’s on-grid capabilities and small, neat package. It would be a very simple house to take to and from RV parks as long as you had access to proper utilities. Lil Blue is not currently suitable for boondocking or variable utility hookups unless it is retrofitted to behave as such (see my notes on going off-grid with Lil Blue up above). However, in my opinion, tiny houses should not be used for traveling long term. My two major concerns with tiny houses on the road are that the materials they are built with are not meant for the constant wear and tear, shear and torque that they will experience being hauled at 60 mph for 8 hours day. This is especially true if you are hauling a house that you did not build yourself. How can you be sure that the materials are properly affixed or that the trailer is correctly rated for the load? Make sure you know and trust that the builders of your tiny house are knowledgeable about these issues. Secondly, RVs. There is a reason RVs have cornered the market on traveling living spaces. They are built with lightweight materials, have a national rating system, are welcome at all campgrounds, insurable, and can easily be financed through a bank. Tiny houses are not in the same league as RVs and are much better suited to being parked full time. So, what do you think? Does life in Lil Blue still sound intriguing and realistic to you? Are you ready to make the leap into the tiny life? If so, don’t hesitate to reach out to me to talk about coming to visit Lil Blue, the payment plans, or any other questions you might have about making Lil Blue your new home - Lil Blue has been sold! Sign up for our newsletter below to stay in touch! Ready to design your own tiny house? Check out our new eBook!